To help customers get the most out of Project Online and improve our service extensibility and flexibility, we've added two methods to the client-side object model that you can use in Project Online apps and workflows. Bulk updates project custom fields. For Project Online only. Available only in the REST API. In addition to providing more flexibility, these methods also offer significant performance improvements when saving and publishing projects in a workflow. This article describes how to use the methods in the REST API and provides instructions for creating a workflow that bulk updates custom fields and a workflow that creates a Project site. 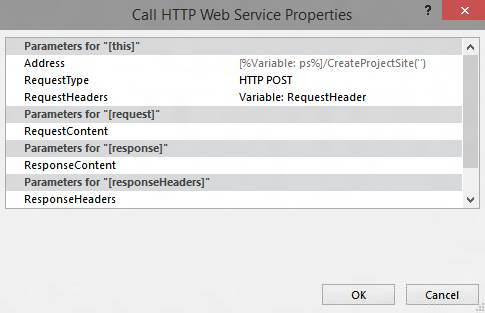 To learn more about calling REST APIs from SharePoint 2013 workflows, see Using SharePoint REST services from workflow with POST method and Calling the SharePoint 2013 Rest API from a SharePoint Designer Workflow. Previously, workflows could only update one custom field at a time. Updating project custom fields one at a time can result in a poor end-user experience when users transition between Project Detail Pages. Each update required a separate server request using the Set Project Field action, and updating multiple custom fields on a high-latency, low-bandwidth network resulted in a non-trivial overhead. To resolve this issue, we added the UpdateCustomFields method to the REST API that lets you bulk update custom fields. To use UpdateCustomFields, you pass in a dictionary that contains the names and values of all the custom fields you want to update. Replace the <site-url> placeholder in the examples with the URL of your Project Web App (PWA) site and the <guid> placeholder with your project UID. Optional. Store the full URL of your project in a variable that you can use throughout the workflow. 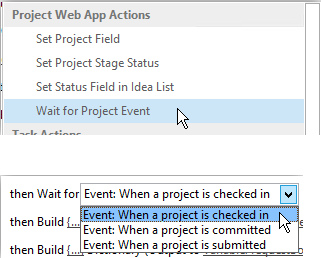 Add the Wait for Project Event action to the workflow and choose the When a project is checked in event. 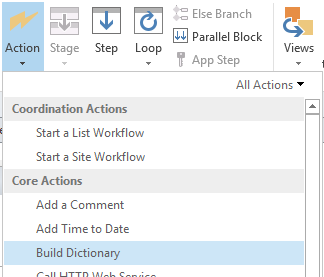 Create a requestHeader dictionary using the Build dictionary action. 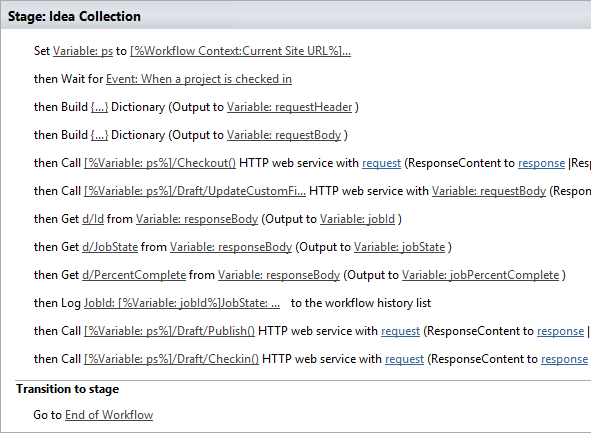 You'll use the same request header for all the web service calls in this workflow. Add the following two items to the dictionary. 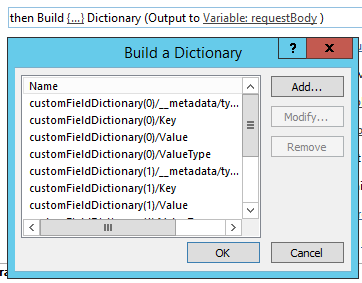 Create a requestBody dictionary using the Build dictionary action. This dictionary stores all the field updates that you want to apply. Each custom field update requires four rows: the field's (1) metadata type, (2) key, (3) value, and (4) value type. If you created your custom fields manually, the values will differ from site to site. If you plan to reuse the workflow across multiple sites, make sure the custom field IDs are correct. Value The value to assign to the custom field. For custom fields that are linked to lookup tables, you need to use the internal names of the lookup table entries instead of the actual lookup table values. If you have a lookup table custom field set up to accept multiple values, use ;# to concatenate values (as shown in the example dictionary below). ValueType The type of the custom field you are updating. The example dictionary below defines updates for three custom fields. The first is for a multiple value lookup table custom field, the second is for a number field, and the third is for a date field. Note how the customFieldDictionary index increments. These values are for illustration purposes only. The key-value pairs you'll use depend on your PWA data. 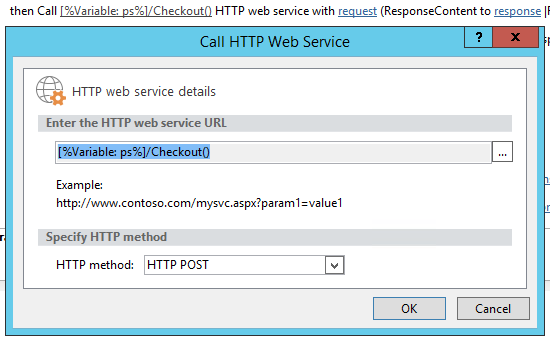 Add a Call HTTP Web Service action to check the project out. 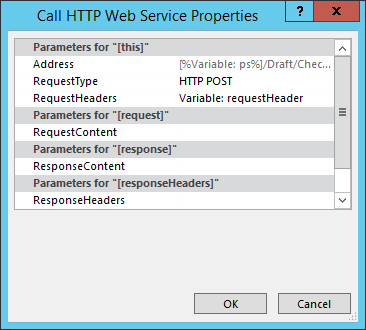 Edit the properties of the web service call to specify the request header. To open the Properties dialog box, right-click the action and choose Properties. 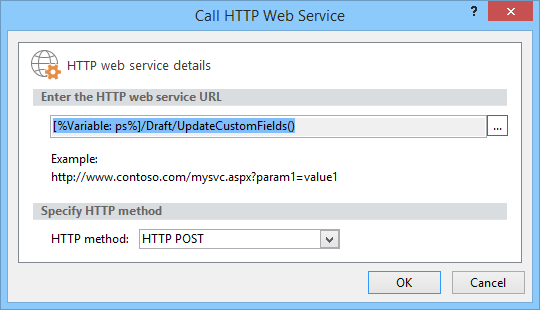 Add a Call HTTP Web Service action to call the UpdateCustomFields method. 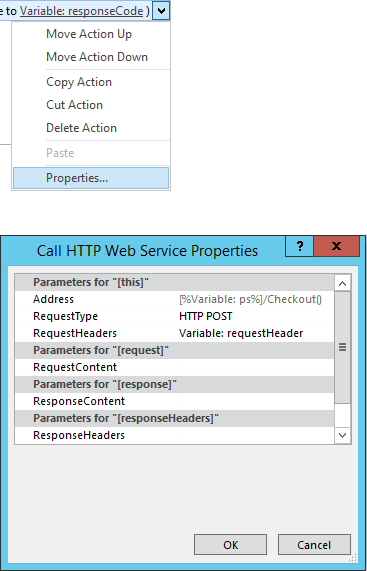 Edit the properties of the web service call to bind the RequestHeader and RequestContent parameters to the dictionaries you created. You can also create a new variable to store the ResponseContent. Optional. Read from the response dictionary to check the state of the queue job and log the information in the workflow history list. 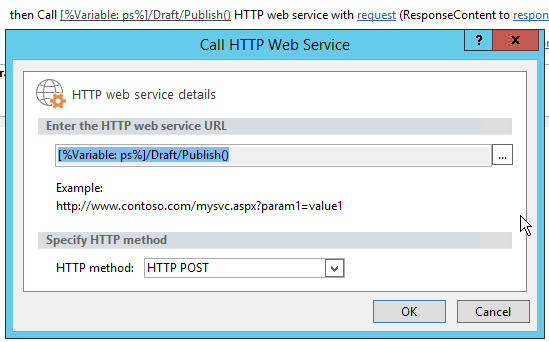 Add a web service call to the Publish endpoint to publish the project. Always use the same request header. 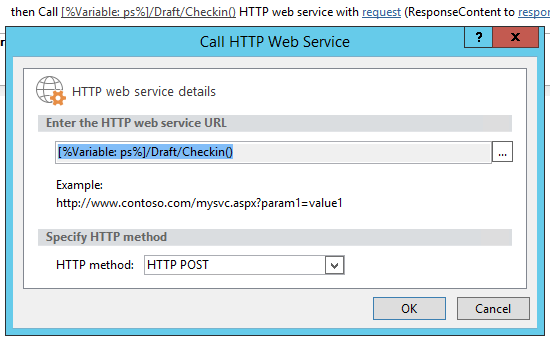 Add a final web service call to the Checkin endpoint to check the project in. Every project can have its own dedicated SharePoint sites where team members can collaborate, share documents, raise issues, and so on. Previously, sites could only be created automatically on first publish or manually by the project manager in Project Professional or by the administrator in PWA settings, or they could be disabled. We've added the CreateProjectSite method so you can choose when to create project sites. This is particularly useful for organizations who want to create their sites automatically when a project proposal reaches a specific stage in a pre-defined workflow, rather than on first publish. Postponing project site creation significantly improves the performance of creating a project. 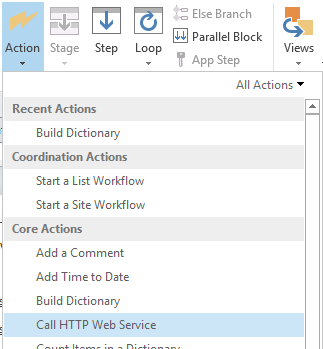 Prerequisite: Before you can use CreateProjectSite, the Allow users to choose setting must be set for project site creation in PWA Settings > ** Connected SharePoint Sites ** > Settings. Create or edit an existing workflow and select the step where you want to create your Project sites. 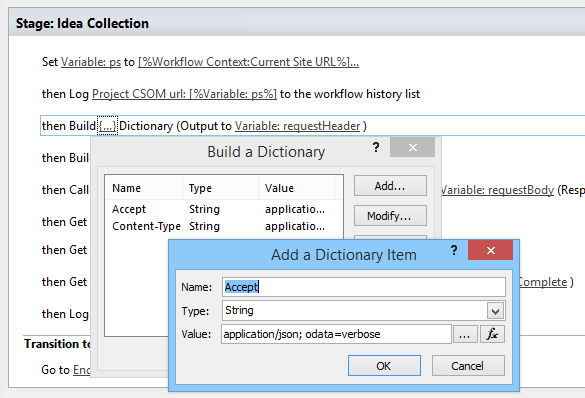 Create a requestHeader dictionary using the Build dictionary action. Pass the name of the Project site to the CreateProjectSite method as a string. To use the project name as the site name, pass an empty string. Be sure to use unique names so the next project site you create will work. 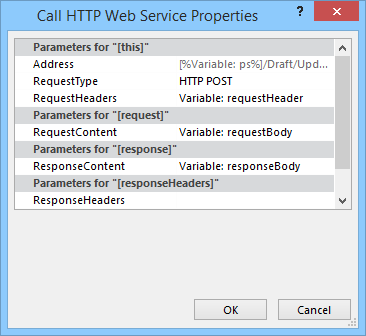 Edit the properties of the web service call to bind the RequestHeader parameter to the dictionary you created.